In The Jaguar Stones, Book Two: The End of the World Club, the action moves from Central America to Spain, as Max and Lola set off on the trail of the conquistadors. As the rest of the world panics about the end of the Maya Calendar, only Max and Lola can avert the coming doomsday as they continue their battle against the Maya Lords of Death. In The Jaguar Stones, Book Three: The River of no Return, Max and Lola are back in the jungles of the Maya and the Death Lords are on the warpath. Can video-gaming, pizza-loving Max Murphy and Lola, his modern Maya sidekick, save the world one more time? Not if they can’t get past the zombie army, the mutant cave spiders, the subterranean hotel, and some very dark family secrets. 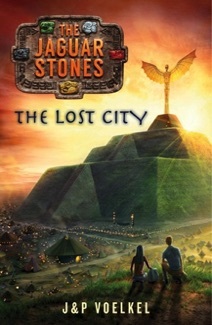 In The Jaguar Stones, Book Four: The Lost City, Max and Lola make one last desperate attempt to save the world from the evil Maya Death Lords, their secret weapons include a roller-skating monkey and the Boston Red Sox.